So, we went and had another baby. About eleven weeks ago, a second son. Rosario Oisin was born on a snowy December morning, with a left hand such an alarming shade of purple I could not look away until it faded into a more reasonable representation of human flesh. He is named for his singular Auntie Rose of course, who will never hold him, but who is, as his big brother says while waving his hands around his small body, everywhere. He is also named for that legendary warrior and poet of Ireland, son of Fionn mac Cumhaill, and that name (Oh-Sheen) means Little Deer. 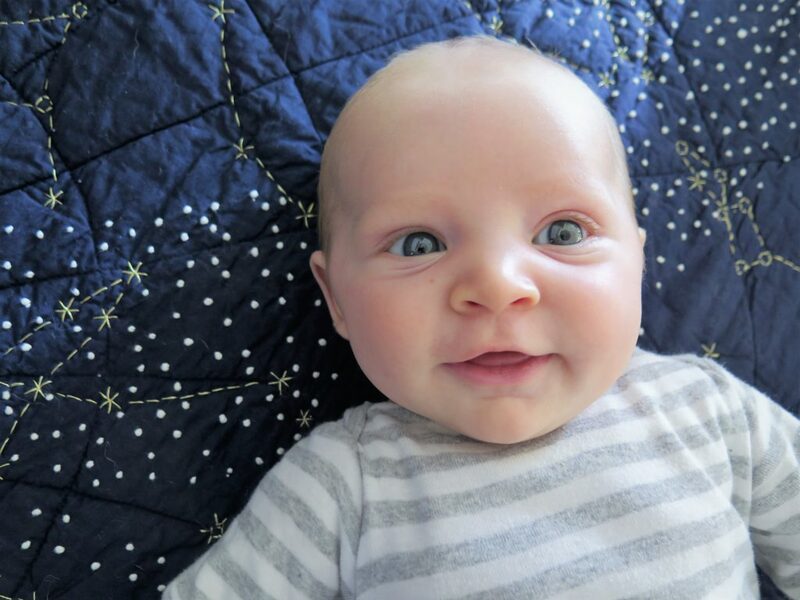 So yeah, kind of big name for a little guy, which may be why his brother Atticus Beren (no stranger to grand names himself) calls him Ozzie, or, when upset, simply “him” or “it” (as in, dada take it). The Little Deer currently has eyes the color of polished juniper berries, a velvety head that begs for a cheek to rub against, and the snore of an old man. He smiles a lot, revealing the hint of a dimple on the right, has limited control over the spastic motions enjoyed by his arms and legs, and speaks only whale. We’re so lucky to have him. Oh dear friend. Slaying me as usual. You and Georgia O’Keefe, who’s writings I began reading a few days ago in the school library. So good, I nearly fell off my stool. Your babes definitely win for the best possible names. Handsome little man… I suspect the DeAngelo brothers will be engaged in great adventure. Heck, it’s in their blood. Maybe one day they’ll visit Boston and explore with us, the Great Atlantic.